From left, Jason Leonard, club sponsor and executive member Chris Topping and Camelot head coach Sam Townsend. After months of planning and anticipation, the England and Lions great Jason Leonard came to the Hemel Hempstead-based Camelot club the previous Thursday night to take a two-hour seniors’ coaching session along with Camelot club coach Sam Townsend. Leonard, who played more than 300 first-class games for Saracens and Harlequins, as well as being capped an incredible 114 times for England and five times for the British & Irish Lions, brought a wealth of rugby experience to Camelot. 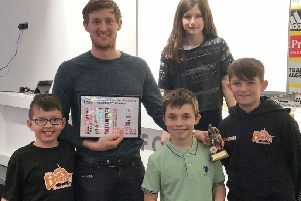 The club were lucky enough for one of its sponsors, Chris Topping, of Jay City Finance, to be at a School of Hard Knocks charity evening where Leonard had offered a two-hour training session as an auction prize to the highest bidder. Former prop Leonard’s coaching session concentrated on the key set-piece areas of the scrum and line-out, where he passed on a number of tricks of the trade to the eager Camelot players. Unfortunately for the members who had gathered in the bar hoping to meet him, Leonard’s busy schedule meant a quick change of footwear in the car park before he had to head off, as he had an early start the next day with a speaking engagement in Blackpool.